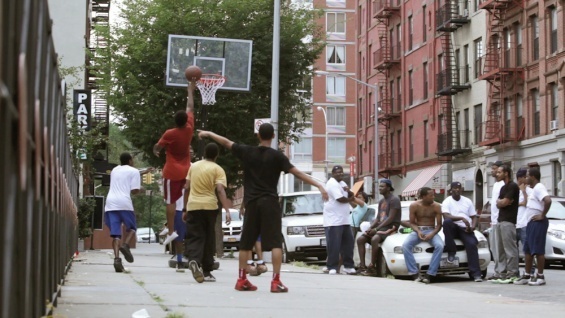 Doin’ It in the Park: Pick-Up Basketball, NYC is an independent documentary directed by Bobbito Garcia and Kevin Couliau. The film explores the history, culture, and social impact of New York’s summer b-ball scene, the worldwide “Mecca” of the sport. In New York City, pick-up is not just a sport. It is a way of life. There are 700+ outdoor courts and an estimated 500,000 players, the most loyal of which approach the game as a religion and the playground as their church. Doin’ It in the Park lovingly uncovers this movement through the voices of playground legends, NBA athletes, and most importantly the common person, or 99 percent, who all day looks forward to experiencing the energy at their local schoolyard. Codirectors Bobbito Garcia and Kevin Couliau visited 180 courts throughout NYC’s five boroughs to create their debut documentary. They traveled to a majority of the locations by bicycle, carrying cameras and a ball in their backpacks. The film’s title refers as much to the subject matter as it does to the method of filmmaking, providing an unprecedented perspective on urban America’s most popular and accessible free recreation. Your full price ticket allows a young person, who plays in a basketball league organized by the Dynasty Project in Chinatown, to attend the screening for free.